It was quite a weekend filled with adventures and misadventures! I thought feeding the cats would be the easiest chore. The food had been left at our house and the bowls were left by the neighbor’s truck. Only problem was when I went to feed the neighbor’s cats, I couldn’t find the bowls so I used some of ours and put them by the truck in the neighbor’s driveway. Upon reviewing the text message, I realized that the bowls were supposed to be at the back door. Not sure how I mixed that up. By this time, it was dark outside so I couldn’t find the bowls by the door either. I moved our bowls by the truck to the back yard. Both cats seemed excited to have the food. When I checked on them Thursday, however, only one cat was around. Now it’s been a while since I had cats, but I remember them being pretty independent so I didn’t worry too much. Today I confirmed both cats are still at the house or nearby. Whew – I didn’t lose a cat. Jengo offered more of a challenge. He is still a puppy who likes to chew. I came home Friday after chapel to discover white feathers all over the kitchen. My first thought was “Oh no, he got a chicken!” Then I remembered the chickens are outside. The feathers were part of Brian’s fly-tying materials. Whew – I didn’t lose a chicken. On Thursday, while I was teaching piano, I heard noise coming from the kitchen. I assumed it was Brian and so didn’t think much about it. When I finished teaching, however, I discovered a bag of potatoes strewn all over the kitchen. Jengo must have been hungry. It only took him three potatoes to realize he didn’t like them. I moved the unsampled potatoes out of reach. Jengo is also unstoppable. The gate at the kitchen door was not a deterrent. At all. Too many times over the weekend I turned around to find him right behind me. It was like having a toddler again. I only wished he went down for a nap. The chicken wire over the gate to the chicken yard was also ineffective at stopping Jengo. He regularly followed me as I checked on the chickens. 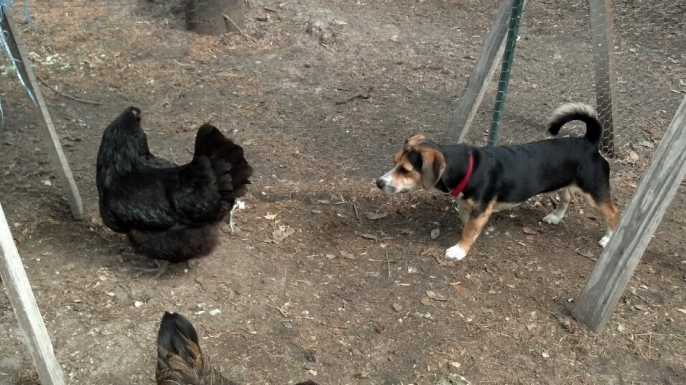 Fortunately, Jengo lacks Bella’s killer instinct and simply sniffed the chickens. 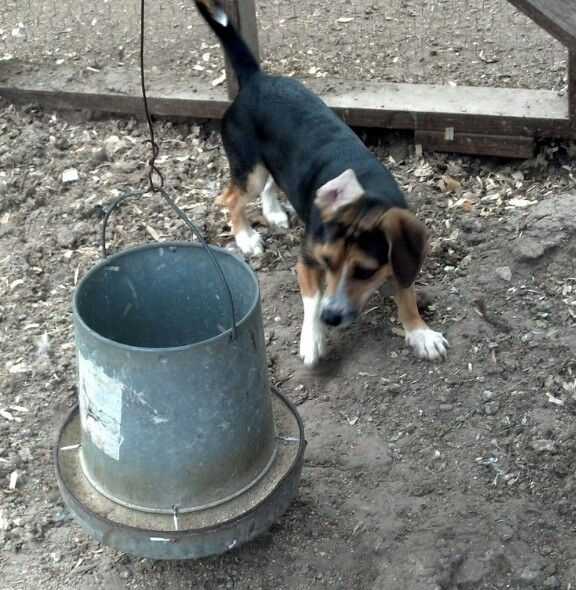 He wasn’t too sure about the chicken feeder especially when it started swinging. He was also very curious about the bees. Since he is a puppy, I was able to distract him before the bees got too irritated. Whew – I avoided treating a bee sting on a dog. The cats are now back in the care of their owners and Miller and Jengo are once again in their own homes. Whew it’s quiet around here. Well, as quiet as the Miller Farm ever gets. I met in the 99 cent store today who said she needed to get rid of a miniature long-haired dachshund……… I didn’t even hesitate to say NO. I’ll stick with four daschunds and thirty-something chickens. Thank you very much.